The Founatin that inspired Keats and his tombstone. Utter this phrase to just about any English Lit major and chances are they will know whom you are talking about. So why the nebulous expression and what body of water is the author referring to? In many literary circles water can indicate a cleansing and certainly Shakespeare's The Tempest is awash with it. Water in Genesis is a means of destroying the wicked and in Matthew as a way of remitting sins. It can also symbolize the river of life or the extinguishing of baptism by fire and re birth. Calling it his "posthumous life" in 1820 John Keats dutifully headed to the warmer climes of sunny Italy after being diagnosed with an almost certain death sentence, tuberculosis. After declining Percy Bysshe Shelley's invitation to join him at Pisa, Keats went to Rome with his friend, the painter Joseph Severn where they lived in the Piazza of the Spanish Steps. Not far from the bottom of the steps is the Fontana della Barcaccia (1627) or "leaky old boat" created by Pietro Bernini, the son of Giovanni. In a city famed for its fountains, this one stands out from the rest. Pope Urban VIII commissioned the Fontana della Barcaccia and even reopened an ancient aqueduct from the 17th century to provide water to the arid region. Instead of spouting grandeur with the magnificence of great crashing torrents, the streams flow with gentle murmurs. Carved in the shape of a half sunken ship with water overflowing its bows, researchers differ on what it is a tribute to. Some say that its mild mannered form was simply a necessity in a part of the city with such low water pressure, while others conjecture that it is symbolic of the Catholic Church ceaselessly afloat in the face of unfeasible odds. Another theory suggests that the fountain is a reminder that the Tiber River which frequently flooded this area of Rome. Still many like to imagine this is the where Domitian, a Roman emperor, held splendid sea battles in his great water stadium. As you are living, Shall be in water writ"
But for the shame of men. Philaster. Act v. Sc. 3. Katharine is eventually convinced by Griffith to exonerate Wolsey with his elegy of forgiveness and pity that is encouraged throughout the play. So perhaps it is with speech and pardon in mind that Keats desires his pithy epitaph. There is no doubt that there are a few readers who are wondering what has brought this 25-year-old poetic genius in the making to such a humble summit. The lower class son of a livery stable owner John was apprenticed to a surgeon only to discard a medical career in pursuit of a passion for poetry. By the fall of 1816 two of his sonnets, O Solitude! if I must with thee dwell and On First Looking into Chapman's Homer were published in the Examiner, a literary magazine edited by journalist and poet Leigh Hunt. Hunt introduced Keats to an upper class circle of literary men including poet Percy Shelly Blythe. With the support of this group Keats was able to get his first volume of verse Poems by John Keats published in 1817. His thesis was a justification of Romantic poetry and it main beliefs as publicized by Hunt and the assailing of the practice of Romanticism as represented by Lord Byron. Keats's second book, the woefully ambitious Endymion (1818), was savaged by the Tory press. Blackwood's sneered: "It is a better and wiser thing to be a starved apothecary than a starved poet; so back to the shop Mr. John." Undeterred, Keats entered a period of rapid intellectual and poetic development, beautifully charted in his remarkable and moving letters. With astonishing speed, supreme confidence, and the greatest artistic mastery, Keats wrote virtually all his major poetry between January and September of 1819. Blackwood's was relentless with their criticisms calling the romantic verse of Hunt's literary circle, "the Cockney school of poetry." But in spite of the disparagement Keats most impressive production of verse followed and by the summer of 1820 his third and best volume Lamia, Isabella, The Eve of St. Agnes, and Other Poems was published. Not only did he benefit from a huge critical success, Keats also fell madly in love with Fanny Brawne (1801-1865) and it was also the year that he first showed signs of tuberculosis. Dying in a small room in Rome Keats realized that his accolades on the publication of the volume Lamia, Isabella would be the end of his career as a poet. Keats told Joseph Severn that he wanted no dedications on his gravestone not even his name, but simply the words: "Here lies one whose name was writ in water." After Keats death Severn deliberated on a variety of combination of Keats' words that would explain his choice was from the poet's sense of disregard by his peers. 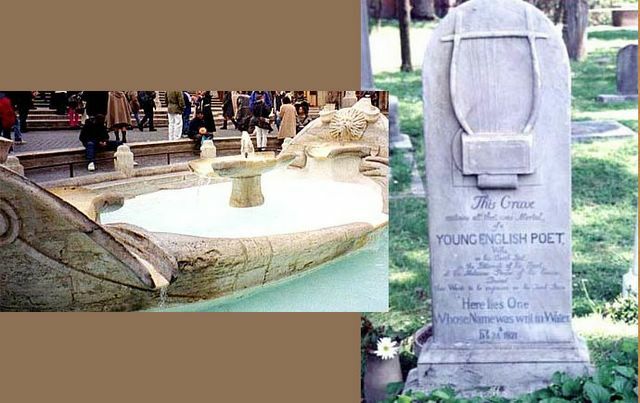 Nevertheless he kept his word for the time being and although the common sentiment towards the remembrance of Keats between English residents and visitors were for the most part considerate, there were a few insolent jeers, -"his name was writ in water"; yes, and his poetry in milk and water.' Even so his friend Shelley nobly defied Keats vague phrase in his own poem Adonais with," He lives, he wakes - 'tis Death is dead, not he." Over the years Joseph Severn eagerly looked for any signs of growing admiration of his friend's poetry, or of change in attitude from the scoffers, but reprints of Keats's poems weren't published until nearly a decade later, "and then only by the Paris house of Galignani, who printed for the continental market, in a single tall volume with double columns, a collective edition of the poems of Shelley, Coleridge, and Keats." When John Keats died it had only been a handful of years after he had begun to write and the value of his legacy was only evident to his friends. There was a deep desire to ensure that Keats' brief work became well known, and it soon attained great popularity. Not only is it a reminder to many that the poet was a victim to the malice of his enemies, but that he was also capable of forgiveness. And like Shakespeare's plays about court rivalries and the ripples they cause across time, the simple epitaph has had its own far-ranging consequences of infighting among the poetical elites because today Keats' odes are to be found in almost every anthology of English poetry.